What was the first example of jihadism in the modern era? Before the rise of the Afghan jihad in the 1980s that brought Muslim militants from many parts of the world to fight the Soviet Union's invasion of Afghanistan, followers of a Saudi man called Juhayman al-Otaibi seized the Grand Mosque in Islam's holiest city of Mecca in November 1979. The mosque was subsequently retaken and Otaibi was executed. Could Otaibi and his followers be defined as 'jihadist' in the conventional understanding today? Useful background on Otaibi can be found in an article by Thomas Hegghammer and Stephane Lacroix, of which the relevant points I will summarize here. As his name suggests, Otaibi was from the Otaiba tribe. He initially served in Saudi Arabia's National Guard and then came to the holy city of Medina. He first became notable as a major figure in a group called al-Jama'a al-Salafiya al-Muhtasiba ('The Salafi Group Commanding Right and Forbidding Wrong') that emerged in Medina in the mid to late 1960s. Initially, the group was focused on religious reform and practices rather than the political system, but some of its eccentric practices, rooted in literal readings of the Qur'an and hadith, led scholars in Medina to confront the movement. This resulted in a split in the group in 1977, whereby some members and most of the original leadership of the group defected and became followers of a cleric called Abu Bakr al-Jaza'iri. However, majority of the group came under the leadership of Otaibi, who, along with his followers, simply came to call themselves al-Ikhwan ('The Brothers,' not to be confused with the Muslim Brotherhood). Otaibi subsequently became wanted by the Saudi police and sought refuge in the desert until launching the takeover of the Grand Mosque. During his exile, Otaibi produced audio tapes and pamphlets to convey his messages. In this case, I will focus on the pamphlet that gives the most insight into Otaibi's political outlook and allows me to make a comparison with the discourse of jihadism today. In this pamphlet, Otaibi discusses concepts of rule over the people and obedience and allegiance to a ruler. - Religion is both personal and political. One cannot merely pursue religion as a private affair or merely pursue worldly authority devoid of the religion. The 'victorious sect' (al-ta'ifa al-mansura, a concept often referenced in jihadist discourse) strives to make the religion supreme, rather than attaining personal supremacy and relegating itself to the private realm for religious observance. - The emphasis on the necessity of jihad as armed struggle, not confined by borders. - The contrast between the present-day rulers of the Muslim world, who do not rule by God's law, and the legitimate ruler who should rule by God's law. - These present-day rulers are not entitled to obedience and allegiance: that is, they have no legitimate Islamic authority over their populations. - Citations of the controversial medieval theologian Ibn Taymiyya. - The need to 'establish the religion' (iqamat al-din) and the need to revive the Caliphate. 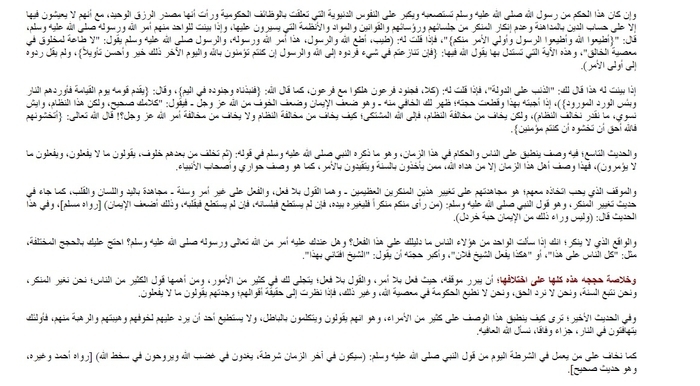 Otaibi follows the line of argument that the Caliph should be of the Quraysh tribe. That argument was also adopted by the Armed Islamic Group in Algeria, and of course the Islamic State's leader claims to be the caliph today partly on the basis of Qurayshi descent. At the same time, there is one major difference. Unlike jihadist discourse today, Otaibi is very reluctant to pronounce takfir: that is, declaring someone to be a disbeliever: but in the context of this controversy, declaring those who affirm affiliation with Islam to be disbelievers. Indeed, he warns that wading into the matter is dangerous, and that as long as someone shows Islam, that person should be judged in Islam, unless he/she does something that necessitates apostasy, though Otaibi does not delve into detail on the issue. Thus, there is no discussion in this text of even the rulers of the current Muslim world committing 'nullifiers of Islam' (a concept heavily promoted in Wahhabi theology) and thus falling into apostasy, whereas pronouncing takfir against the current rulers of the various countries of the Muslim world is a standard theme in jihadist discourse today. Indeed, a very common term jihadists use in reference to the rulers of the Muslim world today is Taghut ('idolatrous tyrant'), which is strikingly absent from Otaibi's pamphlet. Compare Otaibi's pamphlet with the Islamic State training camp textbook 'Course in Monotheism', which discusses the 'eighth nullifier' of Islam as aligning with the non-Muslims and supporting them against the Muslims. Otaibi repeatedly accuses the rulers of the present Saudi state of forging an alliance with/loyalty to the Christians (muwalat al-nasara) and impeding the expansion of jihad. However, he does not pronounce takfir on them. Similarly, despite his attacks on 'ulama/scholars who serve the interests of the states, Otaibi refrains from takfir, and in this pamphlet he actually accords some reverence to Ibn Baz, one of the most prominent Saudi scholars of the modern era who became closely associated with the state. 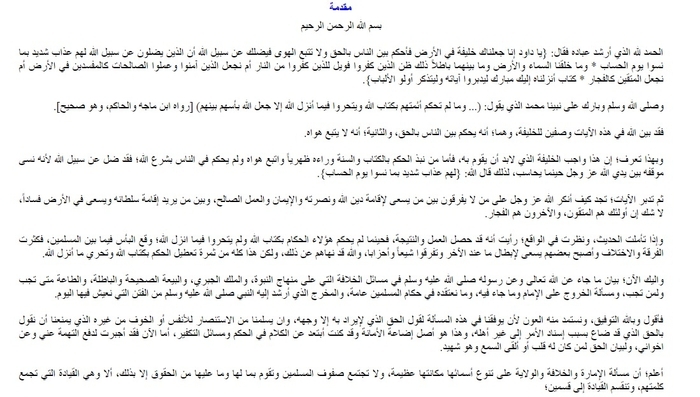 As Hegghammer and Lacroix note, Ibn Baz was initially a spiritual guide for al-Jama'a al-Salafiya al-Muhtasiba. Readers may recall some of the Islamic State's apocalyptic discourse when they see Otaibi's discussion of endtimes. 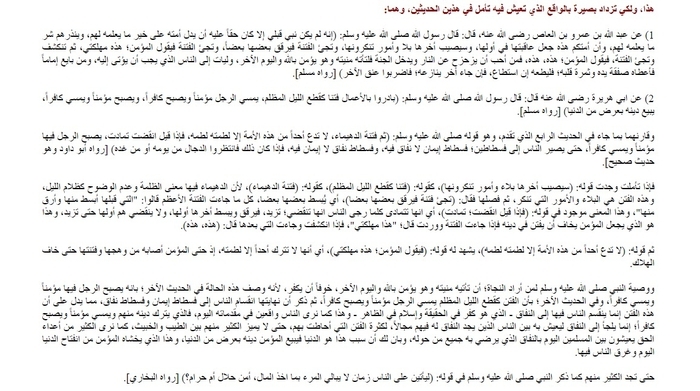 Indeed, Otaibi quotes in full the hadith about a future clash between the Romans and Muslims at Dabiq in northern Syria. Of course, Dabiq became widely known thanks to the Islamic State, which released an English-language magazine under this name and played up the idea of a coming grand clash between the West and the Islamic State in Dabiq. However, as the Islamic State lost territory (including Dabiq), the concept of an apocalyptic clash was downplayed, and now the Dabiq magazine has been discontinued. 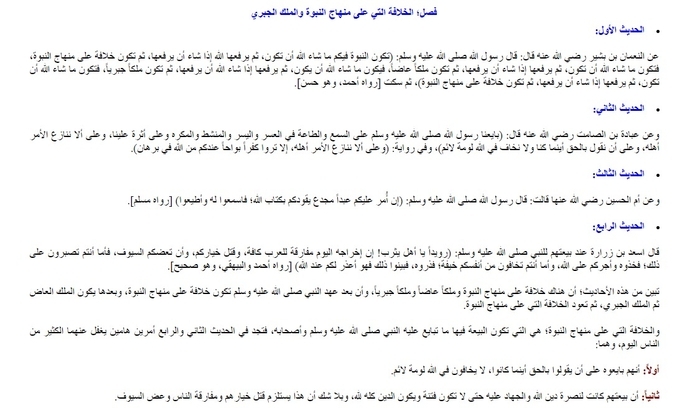 However, Otaibi merely mentions Dabiq in passing as per quoting the hadith. Otaibi places much emphasis on projecting supposed prophecies in the hadith literature about future rulers onto the present day. The summation, in Otaibi's reading, is that the Muslim world currently lives in the era of the Jabiri king (i.e. the oppressive/tyrannical king), which should then be followed by a Caliphate on the Prophetic Methodology. In his writings elsewhere, Otaibi engaged in detailed discussion about the Mahdi (Islamic messiah), who, according to Otaibi, was his associate Muhammad al-Qahtani. For some historical context, the 'Ikhwan' of the past whom Otaibi mentions in the pamphlet were nomadic tribesmen, including members of the Otaiba tribe. They initially aided Abd al-Aziz Ibn Saud (who became the first king of the modern Saudi state) in the expansion and consolidation of his domain. However, in the 1920s, Abd al-Aziz prevented the Ikhwan from carrying out further expeditions in the name of jihad into areas under British influence (namely: Jordan, Iraq and Kuwait). As a result, many Ikhwan tribesmen revolted against Abd al-Aziz, who crushed them in two major battles in 1929. Those Ikhwan tribesmen who did not revolt were integrated into the National Guard. 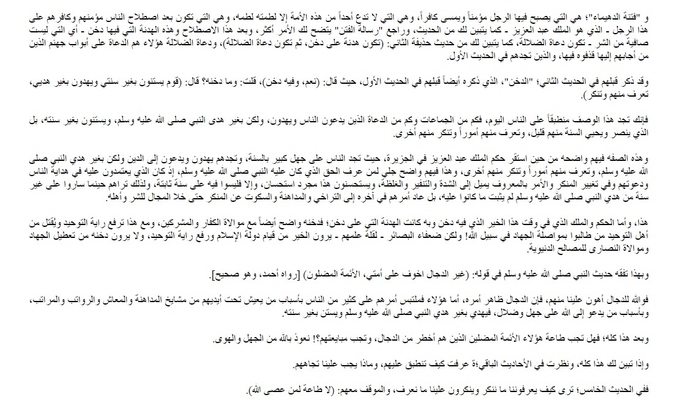 Hence, the impeding of jihad and alliance with the Christians that Otaibi mentions repeatedly in the pamphlet. 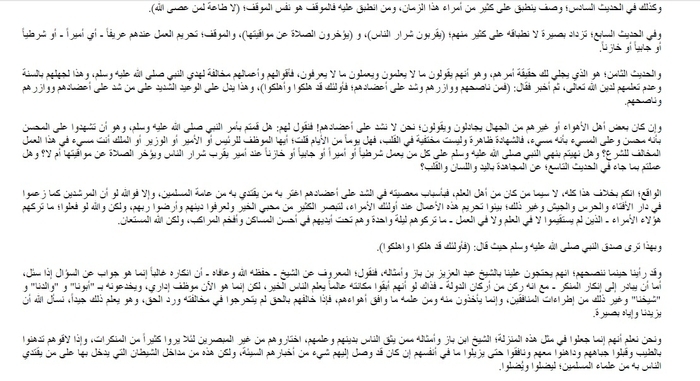 Below is the full text of Otaibi's pamphlet, taken from the website Manbar al-Tawheed wa al-Jihad associated with the Jordanian jihadi ideologue Abu Muhammad al-Maqdisi. 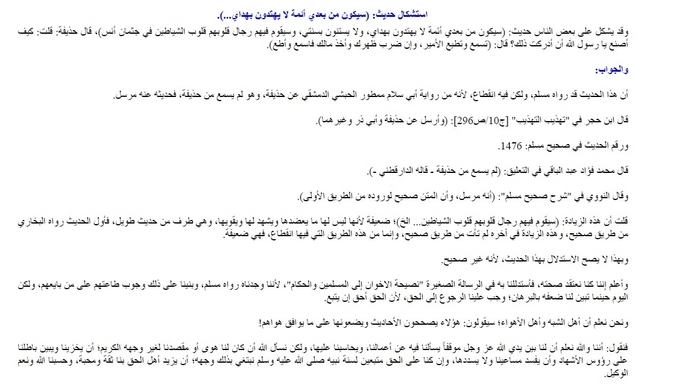 That the work was reprinted on the site is indicative of Otaibi's influence on one of the main jihadi thinkers today, even if we do not define Otaibi as 'jihadist' because of his beliefs regarding the advent of the Mahdi and his reluctance to engage in the practice of takfir that is so familiar these days. Praise be to God who has guided His servants, for He said: "Oh David, We made you a caliph in the land, so judge between the people with truth and do not follow arbitrary whims, for they mislead you from the path of God. Indeed these who go astray from the path of God have a painful torment for what they have forgotten of the Day of Reckoning. And We did not create the heavens and earth and what is between them out of falsehood. That is the thought of those who have disbelieved. So woe from the Fire for those who have disbelieved. Or will We make those who have believed and done good works like the corrupters in the land or will We make the pious like the immoral? A Book We have brought down to you- blessed it is. That they may study its verses and those of understanding may remember." And God's blessings and peace be upon our Prophet Muhammad who says: "....And so long as their leaders do not rule by the Book of God and strive to implement what God has revealed, God will pit their might against each other"- narrated by Ibn Majah and al-Hakim, and it is authentic. So God has made in these verses two qualities of the Caliph: (i) that he rules among the people with truth, and (ii) that he does not follow his arbitrary whims. And thus you know that this is the obligation of the Caliph that he must undertake. As for the one who discards ruling by the Book and Sunna behind his back and follows his arbitrary whims and does not rule among the people by God's law, he has erred from God's path because he has forgotten his position before God- Almighty and Exalted is He- when he is held to account. Therefore God has said: "They will have a painful torment for what they have forgotten of the Day of Reckoning." The consider the verses: you see how God- Almighty and Exalted is He- has condemned those who do not distinguish between the one who strives to establish God's religion, the support of it, the faith and just deeds, and the one who wants to establish his authority and strives to sow corruption in the land. There is no doubt that the former are the pious, and the latter the immoral. And if you ponder the hadith and consider the reality, you see that the deed and result have occurred, for whenever these rulers do not rule by God's Book and do not strive to implement what God has revealed, infighting occurs among the Muslims, for division and difference have become numerous, and some of them have been striving to thwart what the other has, and they have separated as factional followers and parties. And God has forbidden them from that, but this is all of the fruit of impeding the rule by the Book of God and striving to implement what God has revealed. And for you now, is an explanation of what has come from God Almighty and His Messenger (SAWS) on the issues of the Caliphate that is on the Prophetic Methodology, and the Jabiri king, and the authentic and false allegiance pledge, and when and to whom obedience is due, and the issue of revolting against the Imam and what has come in it, and what we believe regarding the rulers of the Muslims in general, and the escape from the internal strifes we live through today to which the Prophet (SAWS) has guided. Thus I say and in God is success. And we seek aid from Him to grant us success in this issue to say the truth that is only intended for His face, and we seek aid from Him to keep us safe from seeking aid for the selves or fearing one besides Him that prevents us from asserting the truth that has been lost because of entrusting the matter to those besides its people. And this is the origin of the loss of the trust and I used to keep my distance from speaking on rule and matters of takfir. But now I have been compelled to ward off the accusation from me and my brothers, and to affirm the truth to the one who has a heart or gives ear and is witness. 1. Leads by the Book of God and the Sunna of His Messenger (SAWS), for this person, if he deviates, is set right by the Book and Sunna of His Prophet (SAWS), and if another besides him deviates, he sets him right by the Book and Sunna. There is no disagreement on the obligation to obey such a person. 2. Does not lead the people by the Book of God and does not take their allegiance on the basis of supporting the religion of God, and indeed he says and does not do and he is not guided by the guidance of the Prophet (SAWS) or follow his Sunna, often applying to the Jabiri king. Such a person is not to be given allegiance or obeyed, even if he is judged by Islam, as will be explained later if God Almighty wills. 1. Desiring authority and supremacy in the land and not establishing the religion, like the Pharaoh and the likes of him. 2. Wanting the religion without authority, so the religion is kept silent and lowly under those who want supremacy and corruption, so these people do not strive to establish jihad, and do not like to mention it, for what is in their hearts from lowliness, and this is one of the branches of Christianity, and one of the qualities of the Christians, the people of monasticism and hermitages. As for what God has been pleased with for us and commanded for us, it is the victory of his religion until it is supreme over all religion. God Almighty has said: "And fight them until there is no more fitna and religion belongs wholly to God." And He has said: "God has promised those who have believed among you and have done good deeds to make them successors in the land just as He made as successors those who were before them and He has promised to enable for them their religion that He has approved for them. And He has promised to replace for them security after their fear. They will worship Me and not associate anything as a partner with Me, and whoso disbelieves that, those people are the gravely immoral. And establish prayer, give zakat, and obey the Messenger: that you may be given mercy. And do not reckon that those who have disbelieved are causing failure on the earth. Their abode is Fire, and evil it as a destination." So the victorious sect that is on truth is the one that has been saved from these two sects: the people of personal supremacy and corruption, and the people of humiliation and lowliness. Ibn Taymiyya (may God have mercy on him) said: "And these two corrupt paths: the path of the one who claims affiliation with the religion and has not fulfilled it in what it requires from authority, jihad and wealth, and the path of the one who takes on authority, wealth and war and does not intend by that the establishment of the religion, and they are the path of those who have incurred His wrath and those who are astray: the first, those who are astray, are the Christians, while those who have incurred His wrath are the Jews. In contrast, the straight path is the path of those whom God has blessed from the prophets, sadiqun, martyrs and just, and it is the path of our prophet Muhammad (SAWS) and the path of his successors and companions and whoso goes on their path and they are the first predecessors from the muhajirun and ansar and those who have followed them with ihsan. God has been pleased with them and they have been pleased with Him. He has prepared for them abodes of Paradise under which rivers flow: there they will abide forever. That is the great attainment"- (al-Fatawa part 28, p. 348). And for you has been presented in the verses the words of God: "He will enable for them their religion that He has approved for them, and He will replace for them security after their fear." So He has shown that before tamkin they were in fear and a state of terror, and thus you see the people of humiliation and lowliness- on whose path many of the preachers today have gone- as they want da'wa to truth that goes without injury, and this is wrong. What's more, they think that in this are impediment and hardship, and so they have contravened the words of God: "And wage jihad for God's sake the right of His jihad. He has chosen you, and not placed an impediment upon you in the religion." So He has commanded us to wage jihad and strive, and informed that He has removed the objection from us, so the greatest objection has been in abandoning jihad and not establishing the religion. And know, that most of those who claim affiliation with the religion and abstinence after the distinguished centuries are not interested in this aspect, which is the rise of authority with the religion, unless that should be in prayer for the oppressors with goodness, because they have no readiness to establish the religion from the two aspects- namely, the aspect of striving with the proof from the Book and the Sunna and making clear the path of the criminals and calling to truth and endurance on the basis of injury, and the aspect of harshness that bears them to establish the jihad and support the religion of God and establish the Islamic State- indeed you find many of these people sympathetic to fulfilling one of these two aspects without the other, so they live like orphans who, whenever a guardian dies for them, they look for another guardian for themselves! And this is the cause that has deviated many of the people who love glory and hate lowliness from the religion, when they have seen the men of the religion in this lowliness that they have inherited, and the authority and power in the hands of those besides them. But when the power has been the hands of the true people of the religion- and they are the 'ulama amirs- there has entered into the religion after the Messenger of God (SAWS) more than what was in his time, and more of the land has been conquered than what was conquered in his time. So when the circumstances have changed and the matter has been entrusted to those besides its people and the religion has become piety and pacifism, the one who wants supremacy in the land over the people has found a path to implement his goal, and the field has been vacant for him, and he has not found someone who clarifies to the people his falsehood in order to beware of him. And the one who cannot repel the falsehood with his tongue, will not be able to repel it with the sword. And one class of the religious have taken up one of the branches of the Christians: namely monasticism, for you find them worshipping in the mosques, thus spending their time and with associations established for them, such that some of them enter them as young people and die in them after growing old. The second class: it has lived under the hands of those previously mentioned: they pledge allegiance to them and are silent about their falsehood, and perhaps they have taken something from their material world and by it they have built a league or mosque, such that is said: 'Built at the expense of sheikh so-and-so.' So we say to this sheikh: from where did you get this money? Is it of the conquests and getting out the disbelievers from the Arabian Peninsula or on the contrary by bringing in the disbelievers with the Muslims, raising their signs in the Arabian Peninsula, and fighting the one who wants to cleanse the Arabian Peninsula of idolaters, and wants to prevent the disbelievers from entering, and by your calling such a person 'Kharijite' or from 'the people of transgression' and your silence about anything of the truth as it contravenes the policies of those under whose hands you live as you pray for them on the pulpits?! But rather God accepts from the pious. And this is the other class, in which there is something resembling the rabbis of the Jews who eat the wealth of the people in falsehood and deviate from God's path. And these two classes are the reason why the religion of Islam has been destroyed and the people have deviated from it. And to these preceding two classes have been added what are called in this age of ours the 'mutwi'a' and the 'murshidun', for you see the 'mutawwi" going forth, lowering his head on account of their evil deeds, and he pretends that his lowering of his head is out of religion and piety! And it is in truth out of humiliation and lowliness! For he has not understood the position of the Ummah of Muhammad (SAWS), for it was brought out to change what is wrong, and not to disregard what is wrong. And these people have taken up the position of the father from the people of what is wrong, for they show them the open-mindedness of humiliation out of lowliness, and you find the hypocrites praising them and they hear them praise and say: 'So-and-so, his religion is good' because he does not disavow what is wrong! As for the 'murshidun', they speak on acts of worship like prayer, fasting and Hajj. And as for the principle- and it is the path of Ibrahim (peace be upon him) and cutting off the people of falsehood, disavowing them and disavowing what is wrong- they do not touch upon it, because it makes clear their disgraceful acts and the disgraceful acts of those under whose hands they live. And if someone who does not have authority in his hands errs, they denounce him! As for the judges and mashayakh of the courts, there is no reason to touch upon the because they have been attached to the authorities, and I have explained this matter more in the summary of 'Message on Commanding What is Right and Forbidding What is Wrong' and the message of 'Lifting the Obscurity', with the evidence, so consult that. 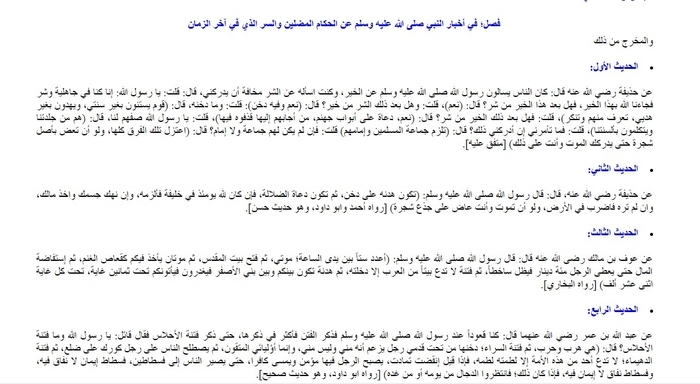 It has been established in the two authentic collections from a hadith of Ubada bin al-Samit (may God be pleased with him) on their allegiance to the Prophet (SAWS): he said: "...And on the basis that we speak the truth wherever we may be and do not fear in God the blame of the blamer." So from this the Muslim must say the word of truth, and not be deterred from saying it by desire or terror. And know that the people in their dealing with the rulers and kings in particular, are often silent about their falsehood- on account of terror or fear of them- so they have feared the blame of the blamer in asserting the truth and disavowing what is wrong, and this is clear error into which many have fallen. And opposite them are a group who have hated the rulers, for they have become enraged by their evil deeds, and that has led them to not acknowledge them in truth when they do good. As for the guidance of the Prophet (SAWS) by which he commanded us, it is as he said: "...And bear witness to the one who does good that he does good and to the one who does evil that he does evil." And this hadith will come in its entirety if God wills. And God Almighty has said: "Oh you who have believed, be firm pillars for God, witnesses to justice, and do not let hatred of a people divert you from being just. Be just, for that is nearer to taqwa. And fear God, indeed God is well-aware of what you do." And indeed he falls into lack of justice: the one who inclines towards hatred, fear, affection and the like out of the whim of the soul, for this is not straight in proceeding on the straight path, but rather rescued is the one who is straight in himself and does not incline towards whims, then he has been proceeding on the path of guidance and light. God Almighty has said: "So is the one who walks fallen on his face more guided than the one who proceeds straight on a straight path?" And the one fallen on his face is the blind ignorant one who does not investigate and has no insight. And the straight one is the one who has stood straight so there is inclination in him towards intense love, intense hatred or intense fear, for there is no personal share for himself, but rather he desires the truth. And the one who is on a straight path is the one on knowledge and evidence, so when uprightness of soul comes together and the path is just and straight and man sees it, he is rescued by God's permission. And the straight path is the Book and Sunna, and whoso takes them up reaches the Hawdh of the Prophet (SAWS). Thus he said: "I have left among you two things. You will not go astray if you adhere to them: the Book of God and my Sunna, and they will not separate until they meet at the Hawdh"- (narrated by Malik and al-Hakim, and it is a sound hadith). And the Prophet (SAWS) also said: "Three things save: justice in contentment and anger, intention in poverty and wealth, and fear of God in secrecy and openness"- (narrated by al-Tabarani in al-Awsat, and it is sound). So man must be just in his ruling in his contentment and anger. Otherwise arbitrary whim will divert him from the straight path, and therefore I have seen these two sects, how one is led astray by fear and hope from the rulers, the other led astray by hatred and loathing. And that was mentioned by Ibn Taymiyya (may God have mercy on him): he said: "So this is a portion that became numerous in the states of the kings as it is a reality among them and many of their amirs, judges, 'ulama and servants. I mean the people of their time. And on account of this internal strife arose among the Ummah, for some looked at the forbidden things they did so they condemned them and hated them, and others looked at the commanded things they did so they loved them. Then the first perhaps considered their good deeds as evil, and the latter perhaps made their evil deeds good"- (al-Fatawa part 35 p. 30). And know that some of the flatterers with the kings and rulers cite as a proof text the hadith of Muslim, when a man asked and said: oh Prophet of God, what is your consideration if amirs arise upon us who ask us for their right and prevent us from our right? What do you command us? He said: "Hear, for upon them is what they have borne and upon you is what you have borne." And a hadith: the Messenger of God (SAWS) said to us: "You will see after me impartial treatment and matters you will disavow." They said: so what do you command us, oh Messenger of God? He said: "Fulfill to them their right and ask God for your right." So they do not condemn the rulers, and they cite this as proof text. And they do not have in this a proof. For this hadith- and what is in its meaning- is on the issue of the rights of the self, like the rulers' appropriation of booty and spoils and the like. As for the religion, it is not of the rights of the self that must endure impartial treatment in it, and therefore you see in the hadith that they asked and said: "They prevent us from our right." As for if the right is of God, it is not so as the obligation is to condemn the one who does not establish the law of God (Almighty and Exalted is He). On the authority of Nu'man bin Bashir (may God be pleased with him): he said: the Messenger of God (SAWS) said: "There will be prophethood among you, as God wills it to be, then God will remove it when He wills to remove it. Then there will be a Caliphate on the Prophetic Methodology, so it will be as God wills it to be, then He will remove it when He wills to remove it, then there will be a king who torments, so it will be as God wills it to be, then He will remove it when God wills to remove it, then there will be a Jabiri king, so it will be as God wills it to be, then He will remove it when He wills to remove it, then there will be a Caliphate on the Prophetic Methodology"- (narrated by Ahmad and it is sound). On the authority of Ubada bin al-Samit (may God be pleased with him): he said: "We pledged allegiance to the Messenger of God (SAWS) to hear and obey in adversity and ease and in enthusias and compulsion and on impartial treatment towards us, and that we would not dispute the matter with its people, and that we would assert the truth wherever we are and not fear in God the blame of the blamer"; and in another narration: "and that we would not dispute the matter with its people, unless you see clear kufr in your eyes in proof from God." And on the authority of Umm al-Hussein (may God be pleased with her): she said: the Messenger of God (SAWS) said: "If there is put in command over you a disabled slaved who leads you by the Book of God, hear him and obey him"- (narrated by Muslim). As'ad bin Zarara said on their allegiance to the Prophet (SAWS): "Slowly oh people of Yathrib. Indeed the bringing out of it today is separation from all the Arabs, and the killing of the best of you and that the swords should wound you. So either you are a people enduring that so take it up and your reward is upon God, or you are a people fearing for yourselves so leave it. So make that clear, for it has been an excuse for you in God's eyes"- (narrated by Ahmad and al-Buhaiqi and it is authentic). It becomes clear from these ahadith that there is a Caliphate on the Prophetic Methodology and a king who torments, and that after the time of the Prophet (SAWS) there will be a Caliphate on the Prophetic Methodology, and after that there will be the king who torments and then the Jabiri king, and then the Caliphate that is on the Prophetic Methodology will return. 1. That they pledged allegiance to him on the basis of asserting the truth wherever they were, and not fearing in God the blame of the blamer. 2. That their allegiance pledge was to support the religion of God and wage jihad for it until there should be no more fitna and religion should belong wholly to God, and without doubt this requires killing the best of you and separating from the people and the wound of the swords. And if you consider today the application of this to the reality, you see that we are living today in the age of the Jabiri king, who is not the one that the Muslims choose as the Caliph, but rather he is the one who imposes himself on them, then they pledge allegiance to him, compelled to do so, and their lack of contentment with this Caliph does not entail that he be removed. Rather the matter is oppressive, and the rulers of the Muslims today have not contracted an allegiance pledge with the people on the basis of that on which the Companions pledged allegiance to the Messenger of God (SAWS) from asserting the truth wherever they are and supporting the religion. But rather it is on the basis of a regime and laws in which there is nothing from the law except that which accords with the arbitrary whims, and as for what contravenes, it is not so. And the point is that it is not a Caliphate on the Prophetic Methodology. And this also shows that this king is not on the Prophetic Methodology. As for personalities of falsehood, allegiance to whom does not entail an obligation to obey them, this will come to you soon if God wills, even though their falsehood does not necessarily demand takfir of them, but rather they are Muslims whose allegiance pledge is false in law by the lines of evidence from the Book and Sunna. If kufr is established against one of them, the ruling upon him is that he is a disbeliever. Otherwise, the principle in the one who shows Islam is that he is a Muslim until he does what necessitates his apostasy from Islam. 1. That he be Muslim, and the evidence is the Almighty's words: "Oh you who have believed, obey God and obey the Messenger and those of you entrusted with the matter"- i.e. from the Muslims. 2. That he be from the Quraysh. 3. That he establish the religion. The evidence for these two conditions is the words of the Prophet (SAWS): "The amirs are from Quraysh provided that they have established the religion." And SAWS' words: "This matter is among Quraysh, no one opposes them unless God makes him fall flat on his face, provided that they have established the religion"- (narrated by Bukhari). And his words: "This matter remains among Quraysh so long as there remain two of the people"- (muttafiq alayhi). And what shows the requirement of the condition of the establishment of the religion is the words of the Prophet (SAWS): "And if there is put in command over you a disabled slave who leads you by the Book of God, hear him and obey"- (narrated by Muslim). So he made the condition of hearing and obeying on the basis that he leads us by the Book of God, and the Prophet (SAWS) conveyed that this matter is among Quraysh provide that they have established the religion. So if they do not establish the religion, it does not remain among them.
. And know that some people take issue with the requirement of the Qurayshi on the basis of the hadith: "And if an Abyssinian slave takes command over you"! The expression 'ta'mmara' is not present in the origins, but rather all the expressions of the hadith are with the expression: "and if there is put in command," "and is there is put in charge" and the like. i.e. If he is put in charge by the Quraysh. As for the Caliph and Imam, he must be Qurayshi. On this basis, it is not allowed to contract allegiance to the one in whom these conditions are not present. And by these conditions the Shari'i allegiance pledge is contracted, and previously you have seen on what basis the Companions (may God be pleased with them) pledged allegiance to the Messenger of God (SAWS), and this is the allegiance: the one who does not do it against him comes the strong threat. Also as per the words of SAWS: "Whoso relinquishes a hand from obedience, he will encounter God on the Day of Judgement and he will have no proof, and the one who dies without an allegiance pledge on his neck, dies a death of Jahiliya"- (narrated by Muslim). And another matter that is required in allegiance is that it is contracted from the one who gives allegiance through the handclasp and sincerity of the heart: i.e. voluntarily and by choice. This is so on account of the words of SAWS: "Whoso gives allegiance to an imam and gives him a handclasp and sincerity of heart, let him obey him as far as he can, so if another comes conflicting with him, strike the neck of the other"- (narrated by Muslim). 1. That the rulers in it are not of Quraysh. 2. They do not establish the religion, but rather they destroy it and wage war on its people. 3. They do not take allegiance from their subjects with the handclasp and support of the heart and its volunteering and choice, but rather by compulsion and vanquishing. And thus you know that it is not obliged to pledge allegiance to them and obey them. As for obeying them in what is not an act of disobedience, it is allowed, and there is no evidence that it is forbidden in what is not an act of disobedience, because the matter is oppressive, and not forbidden by law, despite the fact that the priority- as shown by the law- is to dissociate oneself from them, because their presence destroys the religion and destroys truth and keeps innovation alive and extinguishes the Sunna, and the Prophet (SAWS) directed to dissociate oneself whenever there is mention of youngsters from Quraysh destroying the people. For SAWS said: "The destruction of my Ummah will be at the hands of youngsters from Quraysh." They said: so what do you command us? He said: "Would that the people should dissociate themselves from them." And know that it has come in the law that the Muslims should only have one Caliph, so if allegiance is given to another, the other is to be killed. As per SAWS' words: "If allegiance is given to two Caliphs, kill the latter of them"- (narrated by Muslim). As for today, the Muslims are not gathered on one Imam, but rather each state has a governor upon it, and you cannot judge them by non-Islam until one of them does that by which he apostasises from his religion so he is judged by kufr. As for the one in whom that does not appear, he is judged by Islam as the hypocrites are judged in Islam despite the fact that they are in the lowest place of the fire, and how similar are these rulers to the hypocrites! For you see them- despite their showing Islam- being loyal to the disbelievers and the idolaters: a group that has been loyal to and reconciled with the Jews, a group that has been loyal to Communism, and a group that has been loyal to and reconciled with the Christians and has given refuge to the idolaters from the Shi'a and Rafidites. So all of these Islamic states have a portion of showing Islam and a portion of loyalty to the disbelievers, and indeed they have differed in their orientations but all of the are agreed on waging war on truth and its people if they contravene their policy and the policy of those of the enemies of Islam to whom they are loyal. And in each one of these states you can all to an aspect of the truth that you cannot call to in the others. And indeed the Muslims live under Jabiri rulers, who do not establish among them the religion. As for the one who goes out from obedience, you know that obedience is not obliged except to the one who leads us by the Book of God. As for the one who leads the Muslims by the different systems and laws and does not take from the religion except that which concords with his arbitrary whims, this person has no hearing and obeying, and you have known of the falsehood of an allegiance pledge to him in what has preceded. And the threat against the one who goes out from obedience is the one who enters into obedience then goes out from obedience. As for the one who does not give allegiance and upon whom obedience is not obligatory in origin: this person does not go out from obedience. And this is a clear error, for the Khawarij are the ones who revolted against Ali bin Abi Talib (may God be pleased with him), and they bring out from Muslim those who commit acts of disobedience, and they are extremist in the religion in that which God did not bring down, and the Prophet (SAWS) informed about them: that they pass through the religion as the arrow passes through the prey, and they are the ones who, if man commits an act of disobedience, judge him to be a disbeliever eternally abiding in the Fire, and their madhhab is well-known: we disavow it and its people to God. As for the one who revolts against the Imam of the Muslims and fights him, he is rebelling, aggressing and committing wrong. He must be killed, and must be deterred from his wrongdoing. And we have warned about this because many of the people judge this person as per the ruling of the Khawarij, despite the big difference between the madhhab of the Khawarij and the one who goes out from obedience to the Imam, or the madhhab of the Khawarij is kufr, whereas revolting against the Imam and fighting with him is an act of wrong-doing from which the person who commits must be deterred, and he must be killed. And the one who goes out from obedience to the Shari'i Imam, upon him is a severe threat in that his death is one of Jahiliya, and God has placed a fate for everything. And know that this mistake has an origin in which some of the jurists of the madhhahib of before have erred, as Ibn Taymiyya mentioned, as he made clear their error also in their ruling on those who do not give allegiance to the Imam or go out from obedience to him with the claim that they are transgressors and rule against them with the ruling of Khawarij, despite the fact that what has come in the Sunna against the one who conflicts with the Imam of the Muslims- the Caliphate- is that he is to be killed. As for the one who does not give allegiance or goes out from obedience, upon him is a strong threat- as mentioned before- and there is no evidence that he must be killed or fought. And for you are the words of Ibn Taymiyya (may God have mercy on him): "...And this means the ruling on the one who goes out from obedience is with the ruling of the Khawarij. 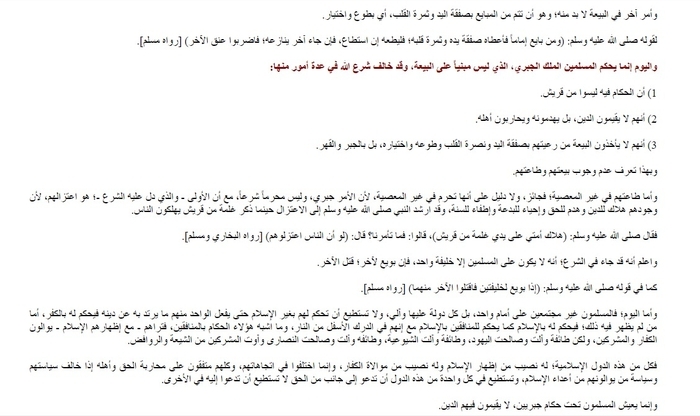 You find this in origin from the opinion of some of the jurists of al-Kufa and their followers, then al-Shafi'i and his companions, then many of the companions of Ahmad: those who classified in the section of fighting the people of transgression applied the same line of thought to those people. Thus you find them, for al-Kharqi proceeded in the same manner as al-Mazni, and al-Mazni in a condensed form in the manner of Muhammad bin al-Hassan. 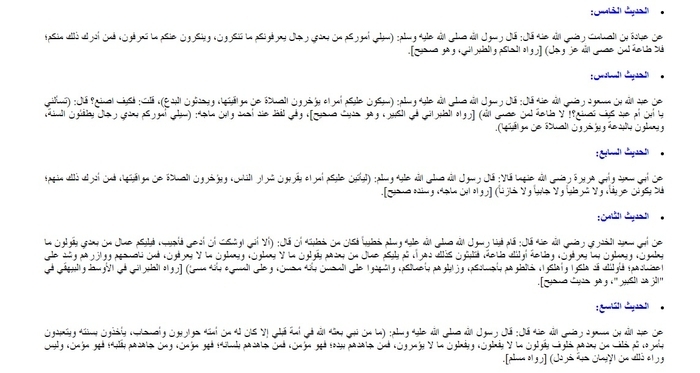 And if that is in some of the classification and arrangement, and the classifiers in the rulings mention fighting the people of transgression and the Khawarij entirely, but there is no hadith on the authority of the Prophet (SAWS) on fighting the transgressors except a hadith of Kawthar bin Hakim on the authority of Nafi', and it is a mawdu' hadith- that is, a falsehood against the Prophet (SAWS): and likewise as I think, there is no section on fighting the transgressors in the books of Malik and his companions, but rather they have mentioned the people of apostasy and the people of arbitrary whims. And this is the established principle in the Book and Sunna, and it is the difference between fighting the one who goes out from the Shari'a and Sunna- that is the Khawarij- for this is what the Prophet commanded- and as for fighting the oe who does not go out except from obedience to a specific imam- that is the one who does not give allegiance or gives allegiance and goes out from obedience, there is no command to do so in the texts"- (al-Fatawa part 4/page 450). And the escape from that. On the authority of Hudhaifa (may God be pleased with him): he said: the people would ask the Messenger of God (SAWS) about good, and I would ask him about evil, out of fear that I would witness it. 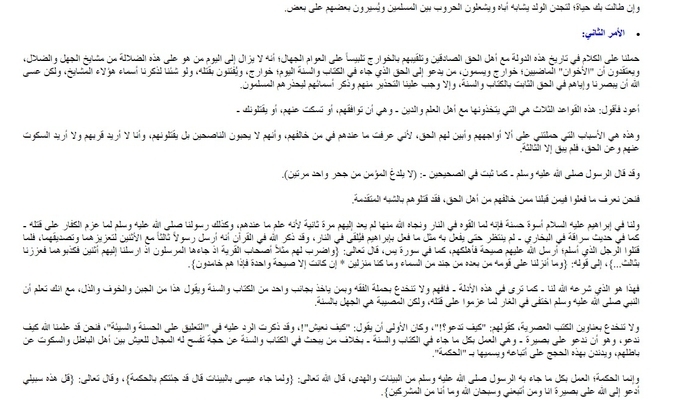 I said: oh Messenger of God, if we are in Jahiliya and evil so God brings us this good, is there evil after this good? He said: yes. I said: is there good after this evil? He said: yes, and in it is dakhan. I said: and what is its dakhan? He said: a people who follow a Sunna that is not my Sunna and seek guidance that is not my guidance. You will know good and bad of them. I said: is there evil after that good? He said: yes, preachers at the gates of Hell, whoso heeds them towards it, they cast him into it. I said: oh Messenger of God, describe them to us. He said: they are of our skins and they speak in our tongues. I said: so what do you command me to do if I witness it? He said: you embrace the group of the Muslims and their Imam. I said: and if they have no group or imam? He said: dissociate yourself from all those sects, even if you bite the root of a tree until death comes upon you and you are in that state (muttafiq alayhi). On the authority of Hudhaifa (may God be pleased with him): he said: the Messenger of God (SAWS) said: "There will be a truce on dakhan, then there will be preachers of error, so if it is for God on that day in a Caliph, embrace him, even if he violates your body and takes your wealth, and if you do not see him, travel all over the world, even if you die while biting on the trunk of a tree"- narrated by Ahmad and Abu Dawud, and it is sound. On the authority of 'Awf bin Malik (may God be pleased with him): he said: the Messenger of God (SAWS): "Count six things before the Hour: my death, then the conquest of Jerusalem, then a plague that takes you the plague that afflicts sheep, then an abundance of wealth such that a man may be given 100 dinars but he remains discontent, then a fitna that leaves no house of the Arabs without entering it, then a truce will be between you and the Byzantines, so they will betray then come upon you under 80 flags, under each flag 12,000 men"- (narrated by al-Bukhari). On the authority of Abdullah bin Omar (may God be pleased with them both): he said: we were sitting with the Messenger of God (SAWS) and he mentioned the fitnas so he mentioned them repeatedly, until he mentioned the fitna of al-ahlas, so someone said: oh Messenger of God, and what is the fitna of al-ahlas? He said: "It is flight and war, then a fitna of prosperity, whose dakhan is under the feet of a man who claims that he is from but he is not from me. But rather my pious allies, then the people accept a man like a thigh on a side, then there will be a fitna of tribulation that will not leave anyone from this Ummah without slapping him in the face. If it is said: it is finished, it is extended. Man becomes in it a believer by morning and a disbeliever by evening, until the people go into two camps: the camp of faith with no hypocrisy in it, and a camp of hypocrisy with no faith in it. When that happens, await the Dajjal on that day or the next"- (narrated by Abu Dawud, and it is an authentic hadith). On the authority of Ubada bin al-Samit (may God be pleased with him): he said: the Messenger of God (SAWS) said: "After me, there will be men assuming charge of your affairs who will try to make you consider right what you disavow, and make you disavow what you know to be right. Whoso of you bears witness to that, there is no obedience to the one who rebels against God- Almighty and Exalted is He"- (narrated by al-Hakim and al-Tabarani, and it is authentic). On the authority of Abdullah bin Mas'oud (may God be pleased with him): he said: the Messenger of God (SAWS) said: "There will be upon you amirs who delay the prayer beyond its times, and introduce innovations." I said: so what do I do? He said: "You are asking, oh son or slave, what to do?! There is no obedience to the one who rebels against God"- (narrated by al-Tabarani in al-Kabir, and it is an authentic hadith). And in the words recorded by Ahmad and Ibn Majah: "After me, there will be men assuming control of your affairs who will extinguish the Sunna, and implement innovation and delay the prayer beyond its times." On the authority of Abu Sa'id and Abu Huraira (may God be pleased with them both): they said: the Messenger of God (SAWS) said: "There will come upon you amirs who bring near the worst of the people, and delay the prayers beyond their times, so whoso of you bears witness to that, let him not be an authority, policeman, tax-collector or treasurer"- (narrated by Ibn Majah and its chain is authentic). On the authority of Abu Sa'id al-Khidri (may God be pleased with him): he said: the Messenger of God (SAWS) arose among us giving one of his sermons: he said: "But I have been on the point of being called so I respond, for there will be after me people who assume control of your affairs: they will say what they do, and implement what they know to be right, and obedience to those people is obedience, so you remain as such by fate, then there will be people after them who assume control of your affairs: they say what they do not know, and do that which they do not consider to be right, so whoso is sincere towards them, supports them and bolsters them, those people have been ruined and have destroyed. Mingle with them in your bodies, and abandon them in your deeds, and bear witness to the one who does good that he does good, and to the one who does evil that he does evil"- (narrated by al-Tarani an al-Bayhaqi in al-Zahad al-Kabir, and it is an authentic hadith). On the authority of Abdullah bin Mas'oud (may God be pleased with him): he said: the Messenger of God (SAWS): "There was no prophet sent by God to a nation before me who did not have disciples and companions from his nation, adopting his Sunna and worshipping as he commanded. Then after them come successors saying what they do not do, and doing what they were not commanded to do, so whoso wages jihad against them by his hand, he is a believer, and whoso wages jihad against them by his tongue is a believer, and whoso wages jihad against them by his heart is a believer. And there is not after that from faith a mustard-seed"- (narrated by Muslim). On the authority of Mu'awiya (may God be pleased with him): he said: the Messenger of God (SAWS) said: "There will be amirs who speak, and they are not responded to, swarming in the fire, following each other"- (narrated by al-Tabarani in al-Kabir wa al-Awsat and Abu Ya'ala, and it is an authentic hadith). Know, oh brother, that through these authentic ahadith the believer gains insight into the reality that he lives in from this time, as in them is an affirmation of the quality of the amirs of evil, and specifying the stance that we must adopt with them and with the people who in their time are the proof for a miracle of the Prophet (SAWS) in his conveying news of the unseen things that we see today before our eyes. And we have mentioned the third hadith and the fourth hadith in the 'Risala al-Fitn'- found in the 'Seven Messages'- and the meaning becomes clear in the ahadith that we have mentioned there, and which will take a long time for us to cite here. And you can find the point there in hadiths 9 and 14, p. 16-7. 1. On the authority of Abu Huraira (may God be pleased with him): he said: the Messenger of God (SAWS) said: "The Hour will not rise until the Romans come upon al-Amaq or Dabiq, so an army from al-Madina comes out against them from the best of the people of the earth at that time. And when they arrange their ranks, the Romans will say: do not stand between us and those who took prisoners from us. We will fight them. So the Muslims will say: no, by God, we will stand between you and our brothers. So they will fight them and a third of them will be routed, whom God will never forgive, a third of them will be killed, the most virtuous of martyrs with God, and a third who will never face trial will conquer, so they will conquer Constantinople, and while they divide the spoils after hanging their swords by the olive trees, Satan will cry among them: the Messiah has taken his place among your people. So they will go out and it will be false, so when they come to al-Sham, it will come out while they are preparing to fight and drawing up ranks. Then the prayer will be established and Jesus the son of Mary will come down and lead them. So when the enemy of God sees him, he will disappear just as salt in water disappears, so if he were to leave them, they would dissolve until perishing, but God ill kill them by his hand so he will show them their blood on his lance"- (narrated by Muslim). 2. On the authority of Yasir bin Jaber: he said: a red wind was stirred up in al-Kufa so a man came ho could only say: oh Abdullah bin Mas'oud, the Hour has come! He as sitting and reclining and said: "The Hour does not arise until inheritances are not divided and there is no joy in spoils of war." Then he said with his hand like this- and pointing towards al-Sham- he said: "The enemy will gather against the people of Islam and the people of Islam will gather against them." I said: you mean the Romans? He said: "Yes, and there will be a terrible fight so the Muslims will make ready a contingent that will fight to the death and will only return victorious, so they will fight until night will cover between them, so both sides will return unvictorious and the contingent will be destroyed. Then the Muslims will prepare another contingent for death that will only return victorious, so they will fight until night will cover between them, so both sides will return unvictorious and the contingent will be destroyed. Then the Muslims will prepare another contingent for death that will only return victorious, so they will fight until the evening so both sides will return unvictorious and the contingent will be wiped out. Then on the fourth day, a contingent of the remainder of the people of Islam will arise against them, so God will decree fate for them, so they will unleash a great killing- or he said: the likes of which has not been seen- such that were a bird to pass by with its wings, it would not leave them until it drops dead. The count will be such that they woill only find one out of 100 people related to each other still alive, so in what spoils can there be joy or in what inheritances can there be division. So while they are as such, they will hear of a calamity even greater than that, for the cry will come that the Dajjal has appeared among their offspring, so they will reject what is in their hands and go forth, so they will send ten vanguard horsemen. The Messenger of God (SAWS) said: "I know their names and the names of their fathers and the colours of their horses. They are the best of horsemen on the face of the earth on that day or of the among the best of horsemen on the face of the earth on that day"- (narrated by Muslim). So you find in these two hadiths that the coming out of the Dajjal will be preceded by the treachery of the Romans and the fight, and here in the third hadith- the hadith of Awf bin Malik- you find in it mention of the treachery of the Byzantines: and they are the Romans i.e. the Christians. And before this treachery is the truce. And in the fourth hadith- the hadith of Ibn Omar- you find in it mention of the Dajjal and the nearness of his coming out after the 'fitna of tribulation' which will be after the people gather on a man, and by this gathering is meant the truce that will be before the treachery and the Dajjal- as we made clear in 'Risala al-Fitn'. And 'the fitna of the tribulation' is the one in which the man becomes a believer by morning and a disbeliever by evening, and it will not leave anyone of this Ummah without giving him a slap on the face, and it is the one that will be after the people- believers and disbelievers-gather on this man, who is King Abd al-Aziz, as becomes clear to you from the hadith, and see 'Risala al-Fitn' for further clarification on the matter. And after this coming together and this truce in which there is dakhan- i.e. which is not purely evil- there will be the preachers of evil, as becomes clear to you from the second hadith of Hudhaifa (there will be a truce on dakhan, then there will be preachers of error), and these preachers of error are the preachers at the gates of Hell: the one who heeds them towards it, they will cast him into it. And they are those you find in the first hadith. And there has been mentioned before them in the second hadith: 'dakhan'. This was also mentioned before them in the first hadith, where he said: "Yes, and in it is dakhan." I said: and what is its dakhan? He said: "A people who do not follow my Sunna and seek guidance that is not my guidance. You will know good and bad of them." Indeed you find this characteristic applicable to the people today, for how many are the groups and how many are the preachers who call the people and seek guidance but not the guidance of the Prophet (SAWS), and follow a Sunna that is not his Sunna. Indeed those who support and keep alive the Sunna among them are few in number, and you will find good things among them and you will disavow other things among them. And this quality among them is clear as the rule of King Abd al-Aziz became established in the Peninsula, as you find people in a state of great ignorance about the Sunna, and you find the seeking guidance and calling to the religion but not through the guidance of the Prophet (SAWS), and you find good things among them and you disavow other things among them. And this is abundantly clear in them to the one who knows the truth upon which the Prophet (SAWS) was, as they relied on it in guiding the people and calling them and changing what is wrong and commanding what is right, inclining towards hardship, aversion and harshness. And they merely deem this good. Otherwise, they are not in it on an established Sunna. And therefore you see them whenever they go upon something that is not a Sunna from the guidance of the Prophet (SAWS), it has not been established what they have been upon, but rather their matter in its end as gone back to languor, hypocrisy and silence about what is wrong, such that the space has become free for evil and its people. This is so, and as for the rule and king who is in the time of this good in which there is dakhan and in which there has been the truce that is on the basis of dakhan, for its dakhan is clear also with the loyalty to the disbelievers and the idolaters, and with this the banner of Tawheed is raised and from the people of Tawheed are killed those who have demanded to continue the jihad in God's path! But those weak in insights- for the lack of their knowledge- consider the good from the rise of the Islamic State and raising of the banner of Tawheed, and do not consider its dakhan from impeding the jihad and loyalty to the Christians for worldly interests. And thus you understand the hadith of the Prophet (SAWS) in his words: "Besides the Dajjal, most fearsome for my Ummah are the Imams who mislead"- (narrated by Ahmad, and it is authentic). For by God the Dajjal is easer upon us than they are, for the Dajjal's matter is open, as for these people, their affair deceives many of the people for reasons of those who live under their hands from the mashayakh of flattery, livelihood, salaries and ranks; and for reasons of those who call to God on the basis of ignorance and error, so they seek guidance in something besides the guidance of the Prophet (SAWS) and following a Sunna that is not His Sunna. And after all this, is it obligatory to obey these Imams who mislead and are more dangerous than the Dajjal, and is it obligatory to pledge allegiance to them?! We seek refuge in God from ignorance and arbitrary whims. And when all this becomes clear to you, and you consider the rest of the ahadith, you know how they apply to them, and what is obligatory on us towards them. For in the fifth hadith, you see how they try to make us consider right what we deem to be wrong, and they condemn us for what we consider to be right, and the position with them is: "No obedience to the one who rebels against God." And likewise in the sixth hadith, a description that applies to many of the amirs of this time, and the one to whom it is applied, for the stance is the same stance: "No obedience to the one who rebels against God." And in the seventh hadith, insight is increased for its applicability to many of them: "They bring near the worst of the people" and "They delay the prayers beyond their times." And the stance is: forbidding work with them as an administrator- i.e. amir- or policeman or tax collector or treasurer. And the eighth hadith is the one that makes clear to you the truth of their matter, and it is that they say what they do not know, and do what they do not consider to be right, for their words and deeds contravene the guidance of the Prophet (SAWS), and this is because of their ignorance of the Sunna and lack of learning of the religion of God Almighty. Then he has informed and said: "Whoso is sincere towards them, supports them and bolsters them, those people have been ruined and have destroyed." 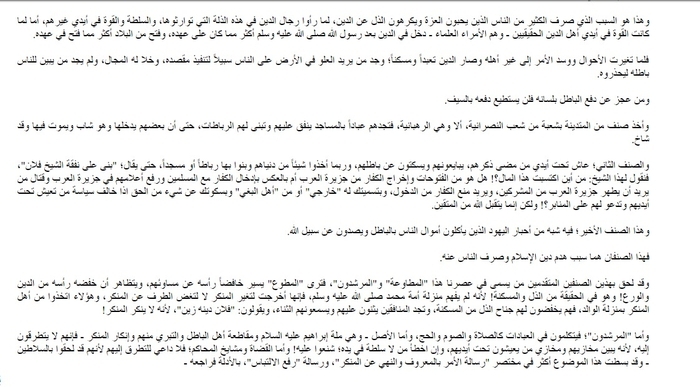 And this shows the strong threat against the one who supports them, aids them and is sincere towards them. And if some of the people of arbitrary whims or those besides them from the ignorant dispute and say: we do not support them! We say to them: did you undertake the command of the Prophet (SAWS) and it is that you bear witness to the one who does good that he does good and to the one who does evil that he does evil, for the witness is open and not concealed in the heart, so have you ever said: oh employee- to the president or amir or minister or king- you are doing evil in this deed that contravenes the law? And have or have you not issued prohibition by the prohibition of the Prophet (SAWS) against every person who works as a policeman, amir, tax collector or treasurer with an amir who brings near the worst of the people and delays the prayers beyond their times? And have you implemented what has come in the ninth hadith, about striving with hand, tongue and heart? The reality: you are the opposite of all this, especially the one from the Ahl al-'Ilm, for by reasons of his disobedience in supporting them the one who follows him from the Muslim populace is misled, but, by God, had it been the case that the guiders are as they have claimed in the Dar al-'Iftaa' and the guard and army and so on, having made clear the prohibition against these deeds among those amirs, many of those love good would have gained insight and known their religion and pleased their Lord. But by God had they done so, these amirs would not have left them alone- those who have not been right in knowledge or deed- they would not have left them alone for one night as they are under their hands in the best residences and most magnificent vehicles. But God is the One whose help is to be sought. And thus you see the truth of the Prophet (SAWS) when he said: "For those people have been brought to ruin and have caused ruin." 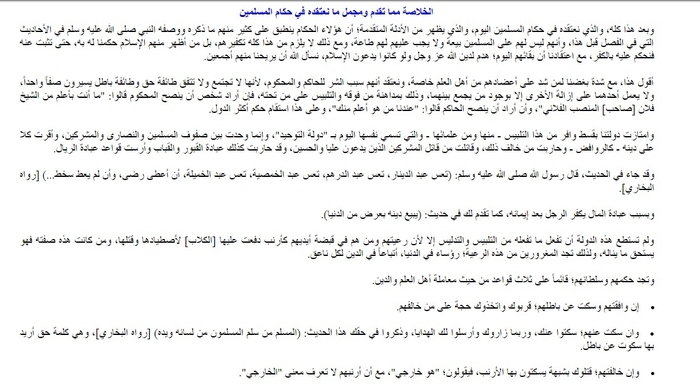 And we have seen whenever we advise them that they invoke as proof against us Sheikh Abd al-Aziz bin Baz and his likes. And we say: it is well-known about the Sheikh- may God protect him and heal him- that his disavowal is mostly as an answer to a question when he is asked. As for his taking the initiative to disavow what is wrong- despite the fact that it is one of the pillars of the state- that would be fine if they had preserved his position as a scholar teaching people good, but rather he is now an administrative employee, and they deceive him with the appellation of 'abuna' and 'waliduna' and 'sheikhuna' and so on from the flatteries of the hypocrites. Rather they take from him and his knowledge what has accorded with their whims, for if he contravenes them in truth, they are not jeopardized in his contravention and restoring of the truth, and he knows that well. We as God to increase our insight and his insight. And we know that they have rather put in the likes of this position Sheikh Ibn al-Baz and his likes from those whose religion and knowledge the people trust: they have chosen them from those who do not have insight lest they should see many of the things that are wrong, and if they meet them they are anointed with good, kiss their foreheads, engage in flattery with them and dissimulate until they remove what is in their souls if something of their bad news reaches them, but these things are among the entry points of Satan by which he enters upon those of the 'ulama of the Muslims whom the people follow: that they may go astray and mislead. And if this ruling from the Messenger of God (SAWS) is one you deem difficult and is heavy on the materialistic souls that have been connected with government positions and have considered that they are the sole source of livelihood, despite the fact that they do not live in them except at the expense of the religion by flattery and lack of disavowing what is wrong from their companions, heads, laws, articles and systems on which they proceed; and if you make clear to one of them the command of God and His Messenger (SAWS), he says: "Obey God and obey the Messenger and those entrusted with the affair among you." So when you say to him: "Fine, obey God and the Messenger, this is the command of God and His Messenger, and the Messenger (SAWS) says: 'No obedience to one created in disobeying the Creator.' And this ayah that you point out, God says on it: 'So if you dispute something, refer it back to the Messenger if you believe in God and the Last Day. That is best and better in outcome.' He does not say refer it to those entrusted with the affair." When you make this clear to him, he says to you: "The sin is on the state." So when you say to him: "No, for the soldiers of the Pharaoh were destroyed with the Pharaoh. As God said: 'So We cast him and his soldiers into the sea.' And He said: 'He will precede his people on the Day of Judgement and lead them into the fire: and wretched it is as a place to be led to.'" If you respond to him with this and show its proof, the secret of him appears to you, and it is the weakness of faith and weakness of fear of God (Almighty and Exalted is He). So he says: "Your words are correct, but this is the system and what are we to do? We cannot contravene the system." But he fears contravening the system, so to God you take the complaint. How can he fear contravening the system and not fear contravening the command of God (Almighty and Exalted is He)?! God Almighty has said: "Do you fear them? God is more deserving for you to fear if you are believers." And the ninth hadith in it is a description that applies to the people and the rulers in this time, and it is what the Prophet (SAWS) mentioned: "Then after them come successors saying what they do not do, and doing what they were not commanded to do." So this is the description of the people of this time except the one God has guided, from those who take up the Sunna and are bound by the command, as is the description of the disciples and companions of the Prophets. And the position that must be adopted regarding them, is to strive against them to change these two great condemned acts: and they are saying without doing, and doing on the basis of no command and Sunna: striving with the hand, tongue and heart, as came in the hadith on changing what is wrong, and it is the words of the Prophet (SAWS): "Whoso of you sees something that is wrong, let him change it with his hand, and if he cannot do so, let him do it with his tongue, and if he cannot do so, let him do it with his heart. And that is the weakest of faith"- (narrated by Muslim). And in this hadith he said: "And there is not behind that a mustard-seed of faith." And the reality that cannot be denied is that if you ask one of these people what is your evidence for this deed? And do you have upon this a command from God and His Messenger (SAWS)? He cites upon you the different proofs, like "All the people are upon this" and "Thus does Sheikh so-and-so do." And his biggest proof is that he says: "The sheikh convinced me of that." And the summation of all these proofs of his despite their difference is that he justifies his position as deed without command and words without deed: as becomes clear to you in many of the matters, and among the most important of them is the words of many of the people: we change what is wrong, we follow the Sunna, and we do not reject the Truth. And we do not obey the government in disobeying God, and so on. And if you consider the truth of their words, you find them saying what they do not do. And in the last hadith, you see how this description applies to many of the amirs, and it is that they say and assert falsehood, and no one dares refute them for fear of them, intimidation by them and being terrified of them. So these people will come together in the Hellfire, a just reward. We ask God for sufficiency. Just as we fear for the one who works in the police today from the words of the Prophet (SAWS): "There will be in the last time a police, incurring God's wrath in the morning and evening"- (narrated by Ahmad and others, and it is an authentic hadith). 1. On the authority of Abdullah bin Amro bin al-Aas (may God be pleased with him): he said: the Messenger of God (SAWS) said: "There has been no Prophet before me, except it was a right upon him to show his nation the best of what he knows for them, and warn them against the evil of what he knows for them. And this nation of yours will have sound state in its first existence, and in its last existence it will be struck with tribulation and things you disavow. And fitnas will come one after another, thinning each other out. And the fitna will come and the believer will say: "This is my perdition." Then it will pass and another fitna comes, and the believer will say: "This, this is my perdition." So whoso wishes to be saved from the fire and enter Paradise, let his death come to him as he believes in God and the Last Day, and let him treat the people as he would like to be treated. And whoso pledges allegiance to an Imam and gives him the handclasp and sincerity of heart, let him obey him as far as he can, and if another comes conflicting with him, strike the neck of the other"- (narrated by Muslim). 2. On the authority of Abu Huraira (may God be pleased with him): he said: the Messenger of God (SAWS) said: "Precede by deeds the fitnas that are like a part of the dark night: man as a believer by evening and a disbeliever by morning; or a believer by morning and a disbeliever by evening, selling his religion with an offer of this material world"- (narrated by Muslim). Compare the two with what came in the fourth hadith that precede, and it is the words of SAWS: "Then there will be a fitna of tribulation that will not leave anyone from this Ummah without slapping him in the face. If it is said: it is finished, it is extended. Man becomes in it a believer by morning and a disbeliever by evening, until the people go into two camps: the camp of faith with no hypocrisy in it, and a camp of hypocrisy with no faith in it. When that happens, await the Dajjal on that day or the next"- (narrated by Abu Dawud, and it is an authentic hadith). So if you ponder, you find his words- "And in its last existence it will be struck with tribulation and things you disavow"- as his words- "fitnas like a part of the dark night"- as his words- "fitna of the tribulation." For the tribulation has in it the meaning of oppression and lack of clarity like the darkness of nighttime, and these fitnas are trial and matters that are disavowed, then he explained them as he said: "A fitna will come, thinning each other out"- i.e. flattening each other. Each fitna that comes will be the greater one. They said: "The one that is before it is flatter than it and thinner than it." And this meaning is found in his words: "When it is said that it has finished, it extends"- i.e. it extends whenever the people ask that it end. It increases, so the latter thins and flattens the former, and the former does not disappear until it increases, and this is what makes the believer fear that there will be torment in his religion, so when the fitna comes and reaches him, he says: "This is my perdition." Then when it passes and there comes the one after it, he say: "This, this is it." Then he said: "It will not leave anyone from this Ummah without slapping him in the face." Bearing witness to that are his words: "So the believer says: this is my perdition." i.e. That it will not leave anyone without slapping him in the face, as even the believer is struck by its blaze and fitna such that he has feared perdition. And the counsel of the Prophet (SAWS) to the one who wishes to be saved, is that death should come to him while he is a believer in God and the Last Day, fearing that he should be a disbeliever, because he described this state of affairs in the last hadith, that man by morning in it is a believer and a disbeliever by evening, and in the last hadith, that the fitnas are like part of the dark night, with man a believer by evening and a disbeliever by morning. Then he mentioned that its end is the division of the people into a camp of faith and camp of hypocrisy, which shows that during these fitnas people are divided into hypocrisy- which is kufr in truth and Islam outwardly- and this is as we see the people in its forefronts today, for the one among them who leaves his religion, being a believer by evening and a disbeliever by morning, takes refuge in hypocrisy to live by it among the people among whom hypocrisy finds space for him, as many are the fitnas that have come upon them, such that many of them cannot distinguish between the good and evil. As we see, many of the enemies of the truth live among the Muslims today in the hypocrisy by which they satisfy all those around them, and it has become clear to you that the reason for this is the material world, for the believer sells his religion in exchange for something of this material world, and this is what the believer fears from the opening up of the world today and the drowning of the people in it. Such that you find many of them as the Prophet (SAWS) mentioned in his word: "There will come a time upon the people in which man does not care how he takes money, whether halal or haram"- (narrated by al-Bukhari). And the Prophet (SAWS) in this counselled that you should treat people as you wish to be treated, because the world through them has reached the point whereby man leaves his religion for the sake of it, and on account of the large amount of deception in these fitnas, so whoso knows the path of truth, let him be guided to it, for they are like a part of the dark night. 1. Taking the initiative to do good deeds. 2. Embracing faith in God and the Last Day until death comes upon you. 3. That the believer treat people as he would like to be treated. 4. Warning against the material world and its fitna. 5. Obeying the Imam whom he obeys with the handclasp and sincerity of the heart. 6. Killing the one who conflicts with him. And if you consider, you find most of the entry points of Satan upon the people in this time are in tafrit on these counsels, for they are distracted by procrastination from taking the initiative to do good deeds, and likewise few there are from the people you will find who treat them as they would like to be treated, even among those who all to truth and good. You find some of them trying to foil what the other has and warning against it- except those who are safe from ignorance and the arbitrary whims of the soul, and they are few in number. And you find how the people have dedicated themselves to the material world such that it has diverted them from many of the commands of God (Almighty and Exalted is He), indeed they have sold their religion and faith for an offering of this material world, such that companies and groups of the people have gone over as victims of that and victims of the oppressive fitnas to kufr overnight, for reason of the misleading imams who plunge with these companies into the crevasses of kufr between morning and evening, after they were believers in God and the Last Day. And there is no power and force except in God the Lofty, the Almighty. And after all this, and what we believe on the rulers of the Muslims today, and what is shown from the preceding lines of evidence:: to many of these rulers is applicable what the Prophet (SAWS) mentioned and described in the ahadith in the chapter before this one. And they do not have the right to allegiance over the Muslims not are the Muslims obliged to obey them. 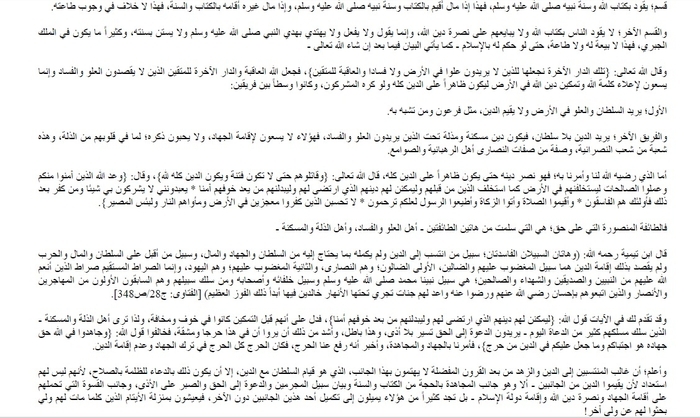 Despite this, takfir of them does not necessarily follow from all this. But rather the one who shows Islam, we rule upon him by it, until the contrary is proven about him so we judge against him by kufr. This is so despite our belief that their remaining today destroys the religion of God (Almighty and Exalted is He) even if they claim Islam. We ask God to deliver us from them all. I say this, with the strength of our hatred for the one who supports them from the Ahl al-'Ilm in particular, and believe that they are the cause of the evil for the ruler and the ruled, because a sect of truth and a sect of falsehood do not come together and agree going forth in one rank, while one of the two does not work to eliminate the other, except by the presence of the one who brings them together. And that is so by flattering the one above and deceiving the one below, for if a person wants to advise the ruled, they say: "You are not more knowledgeable than Sheikh so-and-so [who holds] such-and-such position." And if he wants to advise the ruler, they say: "We have one more knowledgeable than you." And on this basis has the rule of most of the states been established. And our state has been distinguished by justice emanating from this deception- from it and its 'ulama- and which calls itself today 'the state of Tawheed.' And indeed it has united the ranks of the Muslims, Christians and idolaters, and has established each on his religion- like the Rafidites- and has aged war on those who have contravened that, and has fought those who have fought the idolaters who call on Ali and Hussein, and likewise it has waged war on the worship of graves and domes and has set in place the foundations of the worship of the riyal. And it has come in the hadith: the Messenger of God (SAWS) said: "May the servant of the dinar perish; may the servant of the dirham perish; may the servant of the Khamsiya perish; may the servant of Khumaila perish; if he is given, he is content, but if he is not given, he is angry"- (narrated by al-Bukhari). And because of the worship of money, man becomes a disbeliever after his faith, as presented to you previously in the hadith: "He sells his religion for an offering of this material world." And this state has not been able to do what it does from misleading and deception except because its subjects and whoso is in the grasp of their hands, like rabbits on which [the dogs] have been set to hunt them and kill them, and whoso has this characteristic, deserves what he gets, and therefore you find the deceived from these subjects: heads in this material world, followers in the religion of every screecher. And you find their rule and their authority, established on three principles as per dealing with the Ahl al-'Ilm and religion.
. If you agree with them and are silent about their falsehood, they bring you near and use you as a proof against the one who contravenes them.
. And if you are silent about them, they are silent about you, and perhaps they visit you and send you gifts and mention regarding you this hadith: "The Muslim is the one from whose tongue and hand the Muslims are safe" (narrated by Bukhari). And it is a word of truth by which it is wished to be silent about falsehood. And it has been previously presented to you that this appellation has no basis in the law in applying to the one who revolts against the Imam, despite the fact that the Ikhwan (may God have mercy on them) did not revolt against him and did not raise a hand from obedience, but rather they did not obey him when he forbade them from jihad. And this is the obligation for what the Prophet (SAWS) said: "Obedience is in what is right" (muttafiq alayhi). And his words: "No obedience to one created in disobeying the Creator" (narrated by Ahmad, and it is an authentic hadith). So their error becomes clear to you in their ruling against the one who contravenes them in claiming that he is Kharijite, but they deceive the Muslim masses who do not have insight into their religion, and find from the mashayakh of error the one who gives them fatwas without piety or taqwa, and we have no desire to get involved with the dead, for they have reached what they have reached. Removing the suspicion from our brothers who waged jihad in God's path and they were honest with God. Despite that, this state and the 'ulama of evil clothes them in the clothing of the Khawarij who are renegades from the religion of Islam, such that you may find today from the Ahl al-Khayr confused in their matter those who do not declare for God to have mercy on them- by Your Exaltedness, this is a great slander- but rather they- may God have mercy on them- are as we pointed you to an aspect of the reports about them, but if you want more of the reports about them and to be certain of that, you will find the one who is still alive from their brothers who waged jihad with them and they know the truth about them, lest you be deceived by the rulers' praise for themselves and attacking the one who contravenes them, and there is no surprise in that from the people of kings who want to consolidate their rule, but rather the surprise is the one who is claimed to be just and good and then accuses the believers of what they are innocent of. And after he dubbed them 'Khawarij', he burdened their brothers who did not go out with them with fighting them, so he went out with them on their path and began to fight them, so when they met on the field of fighting, he bore each of the two sides against the other, and each of them was inciting and saying: "Youth of Tawheed, and I am the brother of the one who obeys God." So what a bloody tragedy that was. And before that he sent a letter to al-Sharif Hussein in which he said: "Hussein, my brother, you are at their throats and I am at their backs." So when he killed them, dispersed them, and his Jabiri authority was established, he allied with the Christians and impeded the jihad in the path of God, and from the evil closed doors were opened, then sons after him continued on his direction, until the land of the Muslims reached the state it has reached today from evil and corruption, so we say now: where is the rule by the Book and the Sunna that the first of their kings claimed and each one of them to whom allegiance has been renewed has claimed?! Or is that the matter is as the Prophet (SAWS) described in the preceding ahadith in the chapter before this?! And if you live a long life, you will certainly find that the son resembles his father as they inflame wars between the Muslims and turn them against each other. We have engaged in discussion of the history of this state with the honest people of truth and their being called Khawarij in deception against the ignorant masses, as there remain until today those who are on this error from the mashayakh of ignorance and error. And they believe that the past 'Ikhwan' are Khawarij and they call Khawarij those who call today to the truth that has come in the Book and the Sunna, and they authorize for them to be killed, and if we wanted we could mention the names of these mashayakh, but perhaps God will enlighten us and them in the truth established by the Book and Sunna, otherwise it is obligatory upon us to warn about them and mention their names so that the Muslims should be warned. So I say again: these are the three principles they adopt regarding the Ahl al-'Ilm and religion: you either agree with them, are silent about them, or they kill you. And these are the reasons that have led me not to confront them and make clear to them the truth, because I have known what they have towards the one who contravenes them, and they do not like those who advise; indeed they kill them. And I do not want to be near to them and I do not want to be silent about them and the truth, for only three have remained. And the Messenger of God (SAWS) said, as established in the two authentic collections: "The believer is not stung twice from the same hole." So we know what they have done to those before us from those of the people of truth who contravened them, for they killed them with the aforementioned suspicions. And we have in Ibrahim (peace be upon him) a good example for when they threw him into the fire and God saved him from it he did not return to them again as he knew what was among them, and likewise our Messenger (SAWS) when the disbelievers were determined to kill him, as in the hadith of saraqa in al-Bukhari- he did not wait until there should be done to him the likes of what was done to Ibrahim and be thrown into the fire, and God mentioned in the Qur'an that He sent a third messenger with two to support them and deem them credible, so when they killed the man who became Muslim, God sent upon them a cry so He destroyed them, as in the Sura Ya Sin. God Almighty said: "And give to them an example of those of the village: as those sent came to it as We sent two, they declared them liars, so We reinforced with a third...and soldiers from Heaven We did not bring down on his people after him and We were not intending to do so: it was but one shout and they were extinguished." So this is what God mandated to us- as you see in these lines of evidence- so understand and do not be deceived by the campaign of fiqh and by the one who takes up one aspect of the Book and Sunna and asserts this from cowardice, fear and lowliness, even as you know that the Prophet (SAWS) hid in the cave when they were determined to kill him, but the calamity is ignorance of the Sunna. But rather wisdom is implementing all that the Messenger (SAWS) brought from the proofs and guidance. God Almighty said: "And when Jesus brought the proofs, he said: I have brought you wisdom." And the Almighty said: "Say: this is my path, I call to God on the basis of insight. I and whoso follows me. And Exalted is the Lord. I am not of the idolaters." And therefore the solution with these rulers who speak without knowledge and act without insight is to keep distant from them, and if one is asked about something from the religion, one responds with the true words, and one does not support them on falsehood or keep silent about it and bolster them, like those who deceive God and deceive themselves, and say: "To you is your religion, and to me my religion." For this is regarding the disbelievers: to them God ordered you to show enmity, as well as to warn them of the fire and call them by the name of "disbelievers," as God commanded His Prophet in the first of this sura, for He said: "Say: oh disbelievers." As for these people among whom you work, they show Islam, and God has ordered you to separate from them by your work, as in the hadith: "And separate from them in your deeds"- i.e. separate from them, not that your deeds should be one and their deeds should be one, as they must subject every deed- even good one- to their manhaj that the Prophet (SAWS) mentioned: "They extinguish the Sunna" and "They implement innovation." And this is the scene today to the one whom God has granted insight, for you find the showing the religion in the garment of lowliness and degradation and scorn and innovations, as you see in the Hajj and Awqaf ministry and the Dar al-'Iftaa' and commissions to command what is right and forbid what is wrong, as well as the Media ministry in all its means and the like. For this is the true manhaj, and it is the affirmation of truth and disavowal of what is wrong, and not supporting them, for at the minimum they do not care for advice or an advisor. For the best of those who condemn them today is Sheikh Abd al-Aziz ibn Baz (may God protect him), but he continues condemning and they continue in what is wrong, and thus they overturn the boat in the tide in order for it to be drowned, and he is hanging in it calling for rescue, and the boat is only more disturbed. So perhaps God will rescue us and him before the boat drowns. Otherwise, what we consider to be in the interest of the people of the boat is to be ambitious for rescue through it, because each day they are becoming more immersed through it in the darkness of the waves as they are determined to drown. We ask God for sufficiency. If one mixes with the people, one must disavow what is wrong, for if you are silent and you can disavow with your tongue, your silence is wrong, and not permitted for you. And this requires you not to be in the presence of the act that is wrong lest you see it and be silent about it and so you fall into a condemned act and that is silence. And from here you know that the one who does not disavow is not allowed to be in the presence of the act that is wrong, but he must separate from it lest he himself fall into the act that is wrong. All of this is shown by the words of the Prophet (SAWS): "Whoso among you sees something that is wrong, let him change it by his hand. If he cannot, then by his tongue, and if he cannot, then by his heart, and that is the weakest of faith"- (narrated by Muslim). And it is well-known that you will not have recourse to the heart except by something that does not entail with it talk, such as being oppressed, and with oppression it is not allowed for you to remain in the act that is wrong, for you wrong yourself by silence about it, unless you are unable to separate, because God has not excused the oppressed except those who can devise no stratagem and cannot be guided to a path. God Almighty has said: "Those whom the angels take in death, wronging themselves. They say to them: in what state were you in? They say: we were oppressed in the land. They say: was not the earth of God wide enough for you to migrate in it? For those people, their abode is Hell, and evil it is as a destination, except the oppressed of the men and women and children who can devise no stratagem and are not guided to a path. For those people, perhaps God will forgive them. Indeed God is forgiving, merciful." And the Prophet (SAWS) said: "There will soon come a tie upon people when the best wealth of the Muslim is sheep by which he follows the tops of mountains and places of rain, fleeing with his religion from fitnas"- (narrated by al-Bukhari). And know that this assertion is what I asserted before, and some of the people reflect it, for they say: he forbids employment positions; so God forgive us and them, and we ask that our outcome and theirs be the outcome of Joseph and his brothers, for Satan incited evil among them, for some of them said kill him, others said throw him into the pit. Likewise they have spoken, for some of them have said in my case and the case of the 'Ikhwan': kill them, for they are Khawarij, and that the one who kills them will have a reward with God Almighty! And among them are those who say: imprison them, for they are rebels! And besides that from what is well-known. So these are the evil incitements of Satan among the believers, as the Almighty said: "Say to My servants to say what is best. Indeed Satan places evil incitements among them. Satan is indeed to man a clear enemy." So we see refuge in God from his evil incitements. 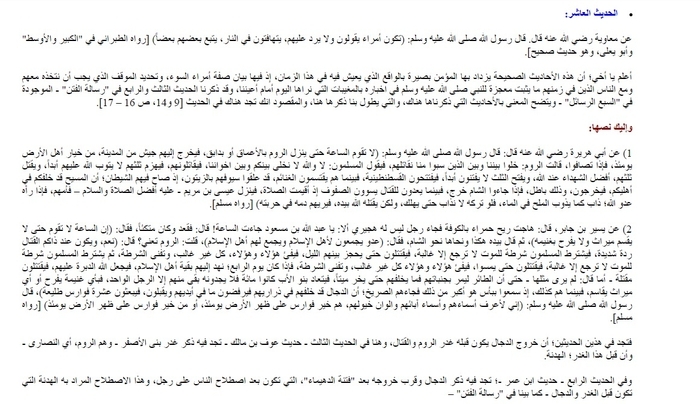 As for the issue of takfir, it is a dangerous issue. And most of those who deal in it are those who have observed little knowledge and impartiality for it. For they make the rulers show Islam like Pharaoh and the Dajjal, and the others in total contrast to that, for they make these rulers like Abu Bakr an Omar (may God be pleased with them both) on the obligation to pledge allegiance to them and obey them. And it has been made clear to you that it does not necessarily follow from the falsehood of the allegiance pledge and lack of obligation of obedience that they are to have takfir declared against them while they show Islam. So perhaps the truth will have become clear to you from what we have presented. And know that these differences were mentioned by the Messenger of God (SAWS) in the authentic hadith brought out by Abu Dawud and Ibn Majeh and Ahmad and al-Hakim from the hadith of Abdullah bin Omar (may God be pleased with them both): the Messenger of God (SAWS) said: "A time will soon come when the people are sifted, and only sediments of the people remain, with their covenants and trusts mingled, and they have differed among themselves, and they have been thus"- and he intertwined his fingers. They said: So what do you command us? He said: "You take up what you know to be right, and leave what you disavow, and you take up your own particular matters and leave alone the matter of your people in general." So in this hadith, the Prophet (SAWS) informed of the arising of disagreement, and made clear to us the escape, and it is that we take up what we know to be right and leave alone what we disavow, and how do we do that? We must balance the affairs on the balance of the law, as opposed to the manhaj of those who do not care for evidence in how they act, what they leave alone, what they know to be right and what they disavow. Then you take up your own particular affairs yourself, and establish them, then you work with the particular matter- i.e. the individuals you can establish with you- and you leave alone the general matter, for they are under a Jabiri king externally wearing the affairs, showing Islam and raising its banner, and they are internally destroying it and waging war on its people, so there is no ability for you to fight them, and there is nothing in your hand from those affairs that can be dealt with as we wish, but rather the lowest of their deeds must proceed according to what pleases them, and they do not give to you disposition in anything of final adjudication. Oh ordeal of Islam from every ignoramus, oh paucity of al-ansar from every knowledgeable one. But many of the people are the reverse, for they have worked according to the matter of the general populace, while in their own particular matters they do not build their worship on established, authentic knowledge in what the Prophet (SAWS) and his Companions were upon. And this is of the deception of Iblis. As you find this man himself in the matter of the general populace spending all of his time, and saying: These people have done and innovated, and in such-and-such place there is corruption, and in such-and-such magazine is such-and-such article, and in such-and-such ministry is such and-such command and forbidding of such-and-such. And he commits a number of wrong acts that the government spreads, then sometimes he says: these are disbelievers; and if he works with them he says: no, they are Muslims and want justice but the corruption is from the officials, and the government must do such-and-such, and there must be such-and-such and...and....and...and...and so-on from wasting time and blame-game. Even as he know that the people are determined upon what they are upon, and they enable their falsehood by the sword even if the contravener is the nearest relative to them, but Satan operates him as such. And at the same time, you find him greatly shortcoming in his circumstances, for he does not learn his religion: the authentic, established knowledge, and his home is filled with pictures. He does not eradicate them; he mixes with the people; he does not disavow what is wrong when he sees it, and he is shortcoming in the Qur'an; he does not recite it; and if he does recite it, he does not work at it. Were he to do this, work at it and abandon the affair of the general populace, it would be better for him. Indeed it is the guidance of the Prophet (SAWS) whose words are inspired from the Lord of the Worlds who knows of us and this time: "You take up what you know to be right" and "You abandon what you disavow" and "You take up your own particular affairs" and "You leave alone the affair of your general people." 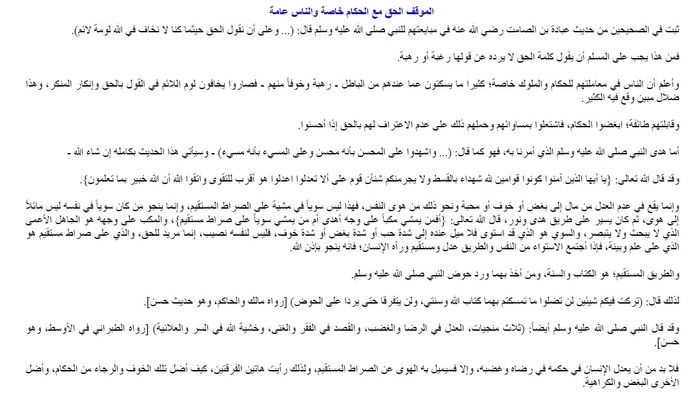 Bringing into doubt the hadith: "Whoso dies without an allegiance pledge on his neck"! Some people may regard as dubious the words of the Prophet (SAWS): "Whoso dies without an allegiance on his neck"! This has to do with when the Muslims entirely pledge allegiance to an Imam, so whoso separates from their group and does not give allegiance, he dies a death of Jahiliya. As for if they do not have an Imam, this threat does not apply. Showing you that is that the Prophet (SAWS) guided Hudhaifa when there is no jama'a and Imam, to separate. Do you think that the Prophet (SAWS) is guiding Hudhaifa to die a death of Jahiliya?! Of course not. And thus you know the error of the one who clings to this hadith and by it imposes as an obligation allegiance to an Imam before he undertakes da'wa and affirmation, and you know that the Prophet (SAWS) did not contract allegiance with the al-ansar until after he preached the truth and made it clear. Bringing into doubt the hadith: "There will be after me imams who do not take guidance from my guidance"
Some people regard as dubious the hadith: "There will be after me Imams who do not take guidance from my guidance, and do not adopt my Sunna as their Sunna: among them will arise men whose hearts are the hearts of Shayateen in the bodies of men." Hudhaifa said: I said: what am I to do oh Messenger of God if I live to witness that? He said: "You hear and obey the amir. Even if he strikes your back and takes your money, hear and obey." This hadith was narrated by Muslim, but in it is a cutting off, because it is from the narration of Abu Salam al-Habashi al-Dimashqi on the authority of Hudhaifa, and he did not hear from Hudhaifa, so his hadith is mursal from him. Ibn Hajer said in 'Tahdhib al-Tahdhib' (part 10, p. 296): "And it was mursal from Hudhaifa, Abu Dhir and others besides them." And the number of the hadith is Sahih Muslim 1476. Muhammad Fu'ad Abd al-Baqi said in commentary: "It was not heard from Hudhaifa: al-Daraqtini said it." al-Nawawi said in 'Sharh Sahih Muslim': "It is mursal, and the text is authentic as it comes from the initial way." I said that this addition- "Among them will arise men whose hearts are the hearts of the Shayateen..."- is weak because it does not have what can bolster it, bear witness to it, and strengthen it. And it is a part of a long hadith, so the beginning of the hadith as narrated by al-Bukhari is from an authentic path, and this addition to its end did not come from an authentic path, but rather from this path in which there is a cut-off, so it is weak. 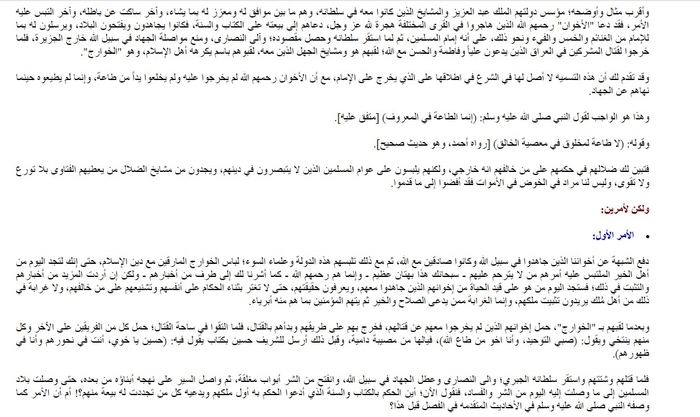 Therefore it is not right to invoke this hadith as evidence, because it is not authentic. And know that we believed it was authentic, so we cited it as evidence in the short message 'Nasihat al-Ikhwan 'Ila al-Muslimeen wa al-Hukkam,' because we found it was narrated by Muslim, and we affirmed on the basis of that the obligation to obey those to who one gives allegiance, but today when it became clear to us its weakness as proof, it became obligatory upon us to return to the truth, because the truth is more righteous if it is followed. And we know that the people of doubts and people of arbitrary whims will say: these people deem ahadith authentic and deem them weak on the basis of what concords with their arbitrary whims. So we say: we by God know that we have a position before God (Almighty and Exalted is He) in which He may ask us about our deeds and hold us to account for them, but we ask God that He should disgrace us and make clear our falsehood to the heads of witnesses and to corrupt our efforts and not make them successful, if we had arbitrary whims or our intention was not for His noble face. And if we are on truth, following the Sunna of His Prophet (SAWS), seeking His face in that, we ask that in us the people of truth should grow in trust and affection. And God is our reckoning and He suffices as trustee. Bringing into doubt the hadith: "The best of your Imams whom you love and they love you..."
Some of the people may cite as evidence for obeying these rulers this hadith: "The best of your Imams whom you love and they love you and you pray for them and they pray for you, and the worst of your Imams whom you hate and they hate you and you curse them and they curse you." They said: Do we not fight them? He said: "No, so long as they establish prayer upon you, no; so long as they establish prayer upon you, except the one who has a governor appointed over him and sees him committing an act of disobedience against God, so let him condemn the one who commits an act of disobedience against God, but he should by no means withdraw a hand from obedience." This hadith was also narrated by Muslim, and we mentioned it in the small message 'Nasihat al-Ikhwan' and in its chain is Muslim bin Qardha, and on him there is discussion as to whether he is reliable or not. Supposing its authenticity, these rulers do not have in it a proof, because it says: 'Your Imams'- i.e. the Imams of the Muslims, so these Muslims are not imams, because their Imamate over the Muslims is false and a wrong act that must be disavowed, as made clear previously with lines of evidence- because they are not of Quraysh and they do not establish the religion and the Muslims have not gathered upon them, but rather those of rule have made the Muslims subservient to their interests, indeed they have made the religion a means to realize their worldly interests, for they have impeded the jihad, allied with the Christians, and brought upon the Muslim every evil and corruption. And we ask God to deliver the Muslims from them, and to place a trustee for them on His part, and place a supporter for them on His part.